Thessaloniki is a city in the north of Greece. It is the country's second largest city. The population of the "Thessaloniki Metropolitan Area" has reached a total of 1,006,730 inhabitants in 2011. Thessaloníki is considered by many the most vibrant city in Greece. It is not a coincidence that almost every visitor falls in love with this city. It is in fact a youth capital for all age ranks that combines history of thousands of years, culture, entertainment and good food! You can take a stroll in Thessaloniki's recently renovated port, wander around the small paved alleys in "Ano Poli" (Upper Town) staring at the unique view of the city, drink a coffee in one of the city's numerous cafes by the sea, visit some of the 22 interesting museums, enjoy a couple of the country's most delicious dishes at Ladadika area and last but not least observe it's residents who are known across the country for their loose attitude towards life itself. Don't forget to have a drink or two together with the locals in Valaoritou area and of course, take a long walk on the paved alleys of the Jewish market near the famous Aristotle Square; this walk will be unforgettable. Thessaloniki has a typical Meditarreanen climate with warm and dry summers and mild but wetter winters. Still, the average annual amount of precipitation is just around 450 mm, making it a relatively arid climate as well. Most of the rain falls from October till January. Summers are driest. The average temperature in summer is around 30 °C during the day and around 18 °C at night. Winters see highs of around 10 °C with nights just above zero. Thessaloniki International Airport (SKG) is located about 15 kilometres from Thessaloniki's city centre. It is the third biggest airport in the country, after the ones in Athens and Heraklion and is the main gateway to the north of the country. Several dozens of airlines serve destinations mainly throughout Europe and a few outside the continent. Aegean Airlines flies to/from Athens, Chania, Düsseldorf, Frankfurt, Hanover, Heraklion, Larnaca, Moscow-Domodedovo, Munich, Mytilene, Nuremberg, Rhodes and Stuttgart and seasonally to/from Kos, Milan-Malpensa, Mykonos, Paris-Charles de Gaulle, Saint Petersburg, Santorini and Tel Aviv-Ben Gurion. The low-cost airline Ryanair offers flights to and from Thessaloniki. Destinations include Bremen, Brussels-Charleroi, Chania, London-Stansted, Milan/Bergamo-Il Caravaggio, Paphos and Rome-Ciampino, and seasonally to/from Bologna, Girona, Hahn, Karlsruhe/Baden-Baden, Oslo-Rygge, Stockholm-Skavsta and Airport Weeze. It is linked to the city centre by a 24-hour OASTH bus service (78 & 78A during the day and 78N during the night). A Thessaloniki Metro extension to the airport is currently under consideration. The private bus company KTEL drives to and from various destinations in Greece. The buses arrive and depart from the bus terminal (station: Macedonia). There are daily regional trains to Veroia-Edessa and Katerini-Larissa, six InterCity (IC) trains and one night-train to Athens via Platy-Katerini-Larissa-Palaiofarsalos-Domokos-Leianokladi(Lamia)-Leivadia-Thiva-Oinoi-SKA-Athens, two trains to Kilkis-Serres-Drama-Xanthi-Komotini-Alexandroupoli and one train to Karditsa-Trikala-Kalampaka. It's about 5 hours by car to Athens, 4 hours to Sofia and 6 hours to Tirana. Walking is the best way to get to know Thessaloniki. Visit the Old Town, the centre of the town, the port and of course the coastal line with the great sunset views. These are some of the best places in Thessaloniki and a really great way to spend your day. Taking a bus is the best way to move inside the city except when visiting the Upper Town ("Ano Poli") and the Castles area. You can buy a ticket for a single route (€0.80/€0.40 for students) or a 90-minute ticket for 2 routes (€0.90/€0.50 for students). We reccomend the one day ticket which is valid for 24 hours. Tickets can be found in the kiosks of OASTH (Organization of Urban Transportation of Thessaloniki city) and most privately owned kiosks scattered all around the city (the known "Periptera"). You can buy a ticket from an automatic seller inside the bus but beware that the price is increased by 10 cents. Dont forget! The automatic seller doesn't give change. For a more complete experience, we recommend you using the Cultural Transfer Line of OASTH, which will enable you to visit some of the major tourist attractions of Thessaloniki. Using the public transportation system, you will save time and money while you will be more friendly to the environment. You can rent a car to go right outside the city and visit the museum and planetarium "Noesis" or one of the biggest malls in the Balkan region, named "Mediterannean Cosmos" for shopping or cinema. There you will enjoy your movie on one of the biggest screens in Europe. 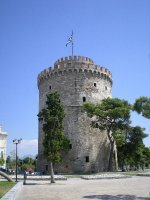 Spend some time and read more about all the places that you can visit places near Thessaloniki. The crystal clear beaches of Chalkidiki, the Royal Tombs and The Macedonian Museum in the city of Vergina or the museum of Pella. You can go skiing in 3-5 Pigadia and Kaimaktsalan or Seli in Vermio, visit the beautiful lake Kerkini in Serres, or even go for fur-shopping in Kastoria town. There are many options available depending on what you are looking for. Ladadika area and Bit bazaar are some of the most popular places when it comes to sofisticated bars and pubs or traditional little taverns respectively. You can also try having a look all around Rotonda near the Aristotle University where because of the college community there are several small taverns and cozy bars that offer red wine or retsina. A couple of alternative destinations would be the coastal avenue "Leoforos Nikis" or going west of the city centre the popular "Valaoritou" street, which is full of all kinds of bars that turn into a club after midnight. You should definitely visit Tsimiski Avenue in the city centre. It is by far the most popular commercial street of Thessaloniki with hundreds of fashion stores and boutiques. Many famous brands have their local branches there. A good alternative option would be "Mitropoleos" street. located on the south of Tsimiski Avenue, while it is heading west in a similar way. We have a comprehensive list of accommodation in Thessaloniki searchable right here on Travellerspoint. You can use our map to quickly compare budget, mid-range or top of the range accommodation in Thessaloniki and areas nearby. This is version 73. Last edited at 3:21 on Aug 2, 17 by sleepBot. 50 articles link to this page.